In the face reading of anyone who have a Pisces Sun, you will often observe a soul, who is adrift in the fantasy world of their imaginations. 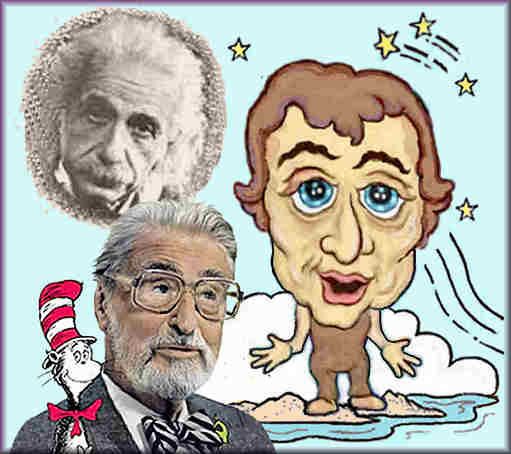 That is what we saw in the faces and personalities of Dr. Seuss and Albert Einstein. It was Dr. Seuss who gave the children of this world his delightful cartoon world of fantasy. Albert Einstein found the numbers to prove his magical “Theory of Relativity”. The art of face reading reveals all of a person's astrological components. Once the art of face reading has been mastered, it becomes easier to recognize the physical lines and structure of ALL of the Zodiac signs. With this, and a few techniques, one can also soon learn to distinguish one astrological component from another. It takes time, but gets richer with every examination. Here, with our looks at Pisces, we see Mobius pattern of mutability and the liquid mannerisms of Water. Watch how the element of Water bloats and rounds the face, as the facial components bob up and down, like seaweed on the ocean’s surface. This gives Pisces her heavy eyelids, drooping nose, large lips and dreamy eyes—as well as the physical traits that appear to resemble a fish. When a person has a Pisces Moon and/or Ascendant and multiple aspects of Neptune’s ruling planet Neptune, the physical traits of Pisces are enhanced. The other Mutable Signs are VIRGO, SAGITTARIUS and GEMINI. This collage of photos provides a face reading of six celebrities with Pisces Suns. They display the physical traits of Pisces, as they show how Mutable Water rounds the flesh, as it keeps their emotions in a perpetual mix! Naturally, the addition of different astrological components changes the disposition and personality of these celebrities. With their watery Cancer Moons, Emily Blunt and Drew Barrymore are the most sensitive and compassionate souls in this group. This Moon accounts for their round lunar temples and the emotional tides in their personalities. George Harrison also has a water Moon, but it is in fixed Scorpio. Note how his features lack the round temples of Cancer. Rather, what we see are the cubical features and the beak of a Eagle. Glenn Close also shows many of the features of Scorpio. The planet Pluto conjoins her Leo Ascendant as it trines her Aquarius Moon–and her Sun’s ruling planet Neptune. What we see is the most theatrical and outrageous lady in this school of Fish– and it can be delightful, or disturbingly frightening. On the delightful end was her hammy and outrageous role as Cruela De Vil in the film 101 Dalmatians. The fright was seen in her intensely obsessive performance in Fatal Attraction. 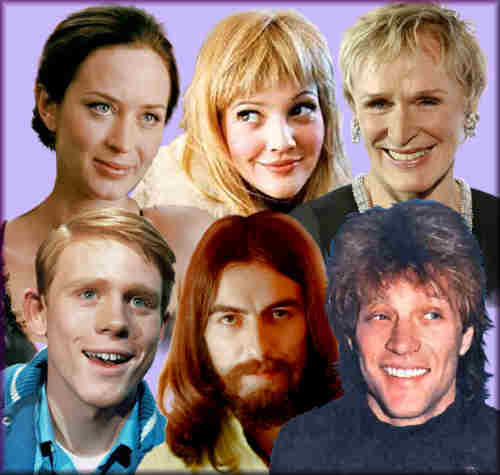 This session concludes with Ron Howard and Bon Jovi, both who have Capricorn Moons. These are the least emotional, and the most highly driven individuals in this lot. It is this placement of their Moons in Cardinal Earth that drove their emotional Suns to create the cinematic and musical dreams that they imagined! This earthy Moon chisels their facial structure, as it hardens the physical traits of Pisces.